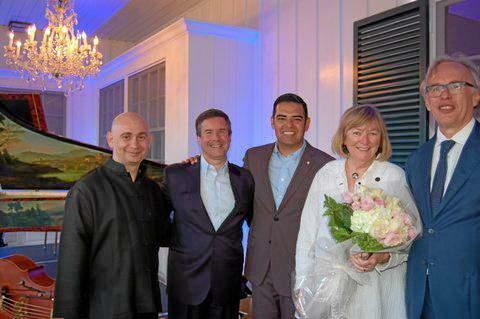 It was a very special homecoming for the welcoming announcement that Musica Angelica was returning to Long Beach! On May 11, at the home of CSULB President Jane and Cooley Conoley, a magical evening was held to welcome the Baroque Orchestra to the Center Theater of the Long Beach Convention Center. They had originated in a private home in Long Beach nearly 25 years ago, and relocated to Santa Monica before returning this year to Long Beach. Through auction items and sponsorships, the event raised more than $115,000 to benefit both Musica Angelica public concerts as well as 180 free concert tickets (900 for the season) for teachers, gifted students and their families to inspire a new generation. The 175 guests were feted with a beautiful and elegant al fresco ambiance complimented with chandeliers and special lighting. But the most spectacular experience of the evening was the performance of the baroque orchestra under the leadership of Austrian conductor Martin Haselbock. The world-class musicians, who played the works of baroque masters on period instruments, included Gonzalo X. Ruiz baroque oboe; Ilia Korol concertmaster/violin; Stephen Schultz, baroque flute; Justin Bland, baroque trumpet; Joel Pargman, violin; David Morris, cello; and Denise Briese, violone. Seen at the scene: Mayor Robert Garcia; CSULB President Jane Conoley; Steve and Lisa Goodling, Pat and Madelyn West, Braden Phillips, Matthew and Roberta Jenkins, former mayors Beverly O’Neill and Bob (with Nancy) Foster, Charlie And Terese Parkin, Laura Doud, fire Chief Mike and Aimee DuRee, Mari Hooper, Jane Netherton, Mike and Arlene Walter, Bill Collier, Larry and Barbara Jackson, Jim and Joreen Hankla, Mort and Susan Stuhlbarg, Doug and Freda Otto, Rich and Pat Archbold, Harry and Maria Saltzgaver, Charlie Beirne, Howard and Elaine Davis, Judy and Gary Cooper, John Thomas and Chris Launi, Jayne Lastusky and Craig Dougherty, Becky Ames, Salvador and Lana Farfan, Wes Westley.